Pixel Press seem to be determined to take apps and gaming to the next level. This activity, of being able to draw your own video game and also sharing it with the others, will first time allow people to bring a personalized game to life. One can simply draw a video game and instantly customize and play + share it. The only barrier that we all have been facing all this time is coding and Pixel Press seem to have taken care of that in the pre-defined coding in the app. This is perhaps not an easy task and I am curious to see what/how many patterns the app will be able to reproduce. Creators will be rewarded via feedback of their friends and the community. Of course, each game will have its core features such as high scores, best completion times and also points earned via collective participation. The only barrier at the moment is that it does not allow you to draw in the app yet. One can either draw on paper or drop the sketch sheet into Photoshop or Illustrator to draw fine lines, and then use that from the photo library on the device. Download a 2 page PDF, one page will be a pre-formatted grid (like grid paper, just a special version built for Pixel Press) and the other page will be a set of simple instructions. The instructions will show you which shapes represent each level component. For example a box represents terrain, and an x represents a spike. It’s a bit more complex than that, but overall it’s very simple. The instruction sheet also lets you know physics rules such as how far the player can jump, and other important details. Pixel Press recommended using a heavy card stock so that the “flatness” of the paper is consistent and you don’t bend or tear it while drawing & erasing. Once you have your level drawing complete, you just need to take a picture of it with your iPad or iPhone and it is converted into a digital level that you can instantly play and start testing. You can get more details in the Questions section on their site. It is fighting for funds on Kickstarter (launching May 7th) to build out the entire app, and we can expect Pixel Press to be available in Q4 2013. The cost can be up to $9.99 for the full version and up to $1.99 for the lite version. Just what we need! First it was the Instagram Camera concept and now we have the Instagram Sunglasses. Both concepts are equally eagerly awaited for production and have been receiving a lot of likes across the world on the web. 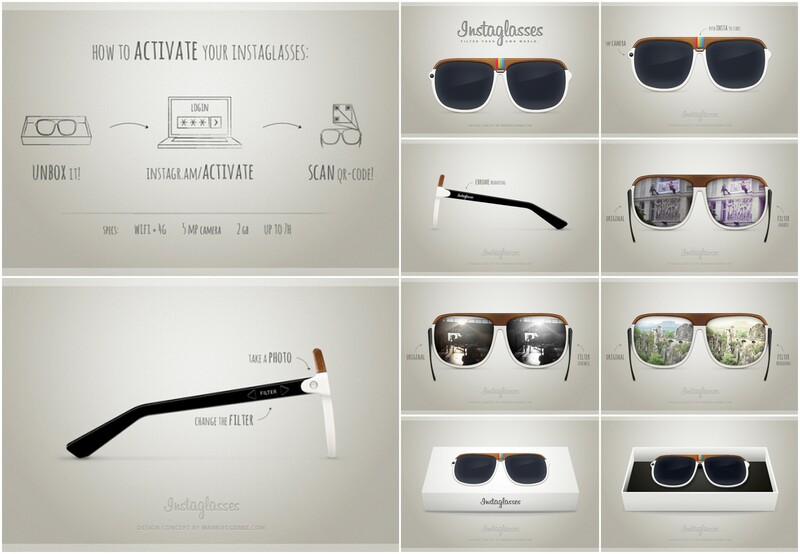 I find the Instagram Sunglasses concept cooler & more clever than the Instagram Camera concept. It definitely took a lot more thinking and effort in design and concept and is a super cool edgy thing to own! The Instagram Sunglasses concept is based on 5 megapixel camera, up to 7 hours of usage time since activation, supported by wi-fi and 4G and storage capacity of 2GB. The filters button allows the user to switch between filters. You can see in the images above how it shows the original vs filtered version. Pretty cool right?! To increase their awareness and to capture a place in the consideration set of the potential car buyers, Mini decided to increase their test drive stores in France. These stores were not the traditional showrooms but more suitable I believe to the lifestyle and culture in the city, they were launched as ” Mobile Mini Store”. The Mini Mobile Stores came to pick up the people and they could hop-in and just take a test drive around the city, without having to visit a showroom and deal with the usual conversational efforts to get into the car! It is a great idea by DDB, Paris to involve people on the streets and catch them where they are, when they are free. Although it is a good effort to go to the people and make test drives happen but Mini could have added some social media element to this by using Facebook places or Foursquare, since the idea is location based anyways. From experience I guess the resources and budgets might have been an issue to take it to a social network platform. Done by Ogilvy China and Ogilvy Hong Kong for Volkswagen, the Augmented Reality Cafe application, communicates the facts about electric cars by Volkswagen very easily to the consumers. Electric cars concept is pretty advanced and new for many people. People who are either buying a car for the first time and do not know what is good for them and their environment or people who currently want to switch to a more environment friendly car. Volkswagen created a cafe where they used daily household appliances like fridge, blender and a personal computer to trigger content using the Augmented Reality application. The application shared facts to educate the people about their electric cars and explained their efficiency in comparison to the those household items. It is a good way to make the people understand since they are already well versed with these daily appliances and can relate to the numbers and information far more easily than just reading it off a brochure or a web page with stand alone information on the electric cars. The Augmented Reality experience was available via the iPad and iPhones. QR codes have come a long way since their launch and over the years marketers have learnt to develop them in conjunction with the available technology, making them even more interesting. Their usage has come a long way since their primary purpose of receiving a text, revealing a rich media content or a simple message on prints ads, stickers etc . Today we see their innovative side in apps, on glasses and even on cars! 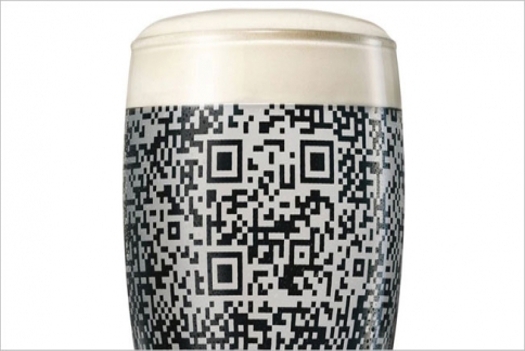 BBDO, New York and Guinness launched special QR code pint glasses where the code is revealed only after Guinness is poured in the glass. Lighter beers do not render the QR code and makes it look like as if the code is a part of the design on the glass. On scanning the QR code with, Guinness drinkers are invited to share their bar location and happenings with Twitter, Foursquare, Facebook and Instagram updates. Coupons and promotional offers are also available on scanning QR code at select locations. This is a really clever idea because the code is revealed only when it is filled with a Guinness. The reason Guinness was able to pull this one off with some creativity is because it played on its color of beer vs the regular light /golden beer colors and used it to their advantage by coming up with a unique idea of standing out from their competitors. The coolest part is that the code is not visible when the glass is empty! Such ideas are cool to get people taking and spread such cool news about the brands via word of mouth at bars all over the city! I like the fact that it is simple and does not require much of an effort by the user to interact with it, after all people are not looking for a long boring experiment at bars when it comes to alcohol marketing, a simple instant trick is definitely more welcoming and fun! To launch the new A -class model, Mercedes-Benz, Germany used the prototypes black and white patterns cleverly by replacing them with a QR code. People who spot the QR coded car should collect 4 QR code badges by scanning with the QR Trophy app. The collection of 4 badges automatically signs up the user to qualify to win a trip to the world premier of the A-Class in Geneva. Besides the car the QR codes were also available on net and randomly distributed in the streets. The QR code landing page for this campaign received over 50,000 visits and 80,000 trailer views, 2,860,000 Google hits and 6,800,000 Facebook impressions. The codes were not even popular among the users but also received huge response from the car-paparazzi. This is quite clever since the prototypes of new models are already disguised in black and white and by using QR code nothing really changes i.e. the car design is still hidden but QR codes add fun and interest to the model. It is a fun way to create buzz about the new model and also engage the followers with its launch. Emart, Korea has come up with one of the most clever usage of QR codes, up to the same level as Guinness’s example above. Apparently the brief was to increase the sales in the lunchtime and keeping this in consideration the QR code was active only from 12 to 1pm each day. Known as “The Sunny Sale” the 3D QR code was placed across the city and the sunlight casting a shadow on the QR code made it visible enough to be scanned. This made it all the more a Sunny Sale special considering it was naturally possible only in the afternoon/lunchtimes. People who scanned the code received a special discount with 25% off redeemable in store or via the Emart mobile site. For such a mobile led idea to increase sales it is a good effort by Emart to include and consider the importance of having a mobile site in place. Over 12,000 coupons were distributed, Emart membership increased by 58% and 25% sales increased during the lunchtime hours. A really cool installation was set up in Hornstull, the last undeveloped area of Stockholm, to avoid people from feeling really angry about the mess and the noise during the construction. Bonnier Properties worked with Abby Norm and installed projectors, speakers and kinect sensors to create a digital/virtual interactive forest. When people passed by the installation the sensor sent signals to grow the forest on the screen by adding a leaf to the forest. People walking by the screen could interact with it using their Facebook, Google+ and Twitter profiles and help to grow the forest. It is a really cool idea to engage people positively online who would have otherwise ranted bad things about the venue on their social network anyways. By engaging people with an exciting installation it helps to create positive awareness about the project and attract people to find out more about the venue & look forward to its official inauguration. With sharing on social networks it reaches people who are not even living anywhere close to this venue. All this just with a cool social media integrated installation! The projection was created by Abby Norm, Sweden.